NB: This post has been updated (20/1/18) and now features 6 ways to restart your Mac and a seventh tip to help you relaunch a frozen Finder. 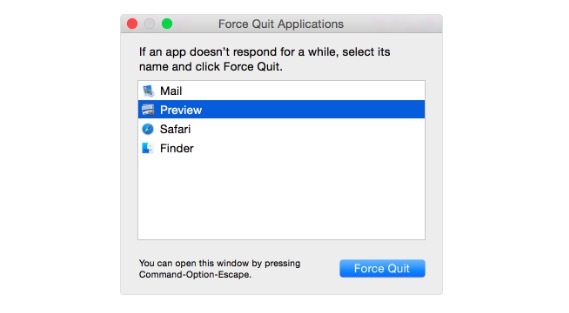 Type Command+Option+Escape to invoke the ‘Force Quit Applications’ window. Now you can quit on app names to select one and then tap Force Quit to quit the app. (Never underestimate the power of the Option key). You can use Command + Option + Shift + Escape to force the currently active app to quit, just hold the sequence down for a few seconds. Control-Option-click (Ctrl-Alt-Click) an app icon on the Dock and you should see the Force Quit option appear, tap it to Force Quit the app. While in the app you want to quit, hold down Shift while you tap on the Apple menu at the top left corner of the screen. Look down the drop down menu that appears and you should see Force Quit and the name of the app you are in. Select the command to quit the app. Because I always have too many browser windows open I always have Activity Viewer running on my Mac. I use Activity Monitor to identify which apps or operations are eating my memory and slowing performance. Unresponsive apps will appear in red, you can help your system by selecting these and then tapping the X button at the top left of the app window to invoke the Force Quit command. Tap Force Quit to leave that app. I find Activity Monitor the most reliable of the bunch when all else fails. Beware — you may find that any windows you have open in the application you quit using this command may not be remembered by the app. You will likely also find that Auto-Save doesn’t work, so anything you are working on will also be gone. It is, however, a really quick way to quit an app. Option 1: Select Finder in the Force Quit menu item window, then click Relaunch. Option 2: Option click the Finder icon in the Dock and choose Relaunch. In both cases, the Finder will be unavailable for a few moments while it restarts and you may experience a little system lag — don’t worry, this is temporary. Control-option-click is a quick way to invoke Force Quit. Next story Now Google’s put its name to WiFi will Apple open a new AirPort?